Once again, I apologize for the delay in posts! For you regular Paula’s Plate readers, you may remember that I’ve been having some computer problems recently. I thought I had them fixed, but on Tuesday my screen went blank (again!) and in turn needed a new hard drive installed. I am finally up and running, hopefully permanently, but please learn from my experience – back up your information! Okay, off my soapbox and onto the recipe. Today I want to share with you a super delicious, yet ridiculously simple pumpkin dip that tastes just like pumpkin pie. You may have seen this idea in the blogosphere recently, (I saw a tasty version using vegan cream cheese on Chocolate Covered Katie the other day). This is my variation. 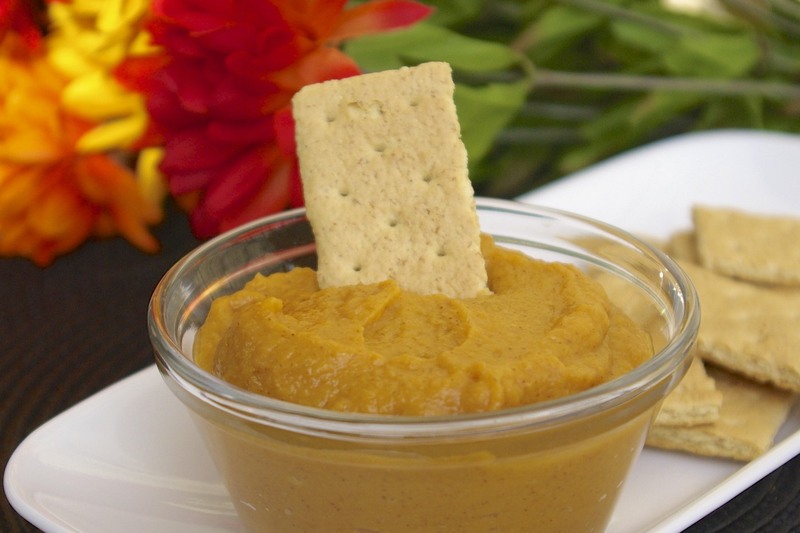 Smooth, creamy, and flavorful, this pumpkin pie dip packs a delicious and nutritious punch. What’s more, the recipe is made with ingredients you likely have in your kitchen! Canned pumpkin, greek or regular vanilla yogurt, maple syrup and warm fall spices combine together to make a tasty dip perfect for your next fall party, a refreshing afternoon snack, or even an easy dessert. Serve this dip with graham crackers and fresh fruit and you have a tasty version of pumpkin pie in less that 5 minutes flat. Enjoy! Whisk together all ingredients except for cool whip until fully incorporated. Refrigerate until ingredients are cool. This step is optional, you can certainly eat the dip immediately, but the flavors improve after about 10-15 minutes. Serve with graham crackers and fresh fruit and enjoy!